We usually expect to have to swat a fly or two in the house during the summer months, when doors and windows are left open and there are plenty of flies coming in from outside. But what about the flies you find indoors during winter, when doors and windows are sealed tight, and you wouldn't think any flies could survive the cold? These tend to be big, fat flies that sit on walls and windows, and they're not ordinary house flies. Those large flies in your home in winter are probably cluster flies, which overwinter in the protected areas between the inside and outside walls of your home, or in the attic or basement. Overwintering insects generally stay in secluded areas until the warming and lengthening days of spring pull them from hiding. But all too often, overwintering cluster flies are drawn into the warmth of the home's interior, finding passage through cracks and openings. Body characteristics. 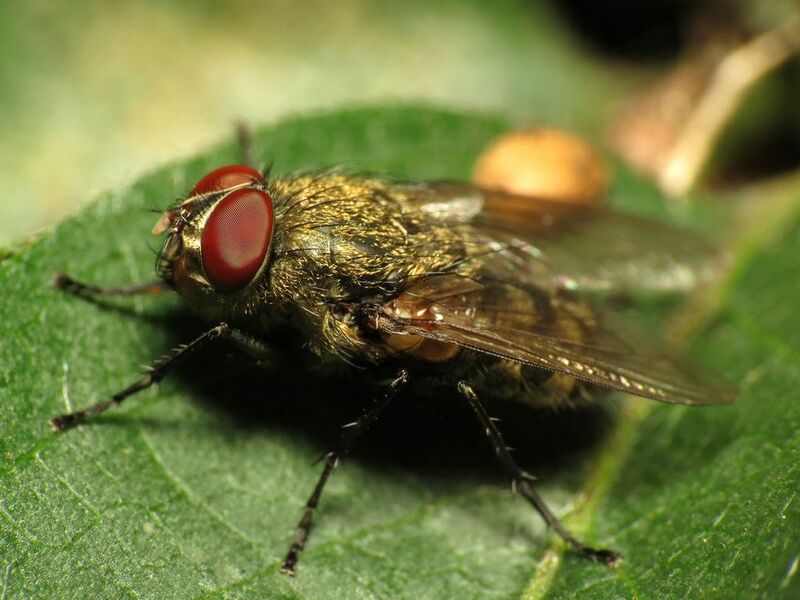 A cluster fly is a bit larger than a house fly and has a black/silvery-black checkered body. Young, newly emerged cluster flies have short light-brown/yellowish hairs on their lower bodies. Sluggish movement. The cluster fly will fly around the home but at a less frantic pace than that of the house fly. Overlapped wings. When at rest, the cluster fly will overlap its wings; the house fly's wings remain separate. Clustering at windows (thus its name). If there is a large population of cluster flies, they tend to cluster along windows or inside attics and usually in little-used areas on warm, sunny days. These flies normally live outdoors and are most likely to appear in the spring and fall. But overwintering cluster flies can emerge into homes and build throughout the winter as well as spring and fall. Cluster flies don't cause much of a problem beyond annoyance. They are not known to transmit disease or damage structures, and they do not reproduce after emerging into the home. However, they can leave tiny dots of excrement where they cluster, and large numbers can be a significant nuisance within a home. Once cluster flies enter a building, to harbor within the walls or buzz around the rooms, control methods are limited. Although insecticides can kill the flies harboring within walls, large numbers of dead or dying flies can attract secondary pests such as beetles and rodents. Because the flies are sluggish, it is usually fairly easy to swat or vacuum those that find their way indoors. But, unfortunately, just as you get rid of these, more are likely to emerge, causing an ongoing process of swatting, vacuuming, and exasperation. Also take care to ensure all doors and windows are tightly fitted, and repair any holes in window screens. For ongoing prevention, you can use yellow sodium vapor or halogen lighting outside to reduce insect attraction. Pesticides have limited effectiveness in control of these flying insects. However, some control can be achieved by a professional application of an insecticide to the south-facing (sun-warmed) side of the structure before the flies begin to cluster on the walls in early fall. An application of pesticide dust in wall voids can help to kill the flies before they can breed.